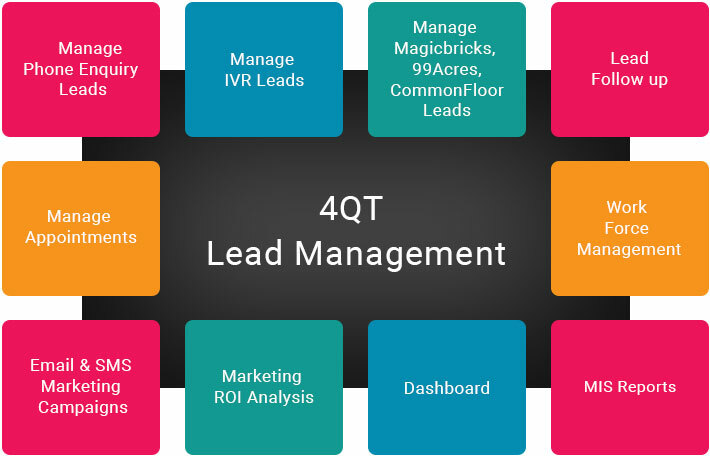 4th Quarter Technology's Lead Management software for Villas, Hirise Apartments and Plot Layout Projects is an advanced and user friendly software with state of the art functionalities and comprehensive set of features. Complete 360 degree analysis of leads Project wise, Source wise, Manager wise, Site Visit wise etc. SMS and EMail Quotations, Project Site Plan, Floor Plan, Brochure, Pictures etc. Integration with web portals such as Commonfloor, Magicbricks, 99 Acres, Olx, Housing.com etc.